MANILA, -- Two (2) Britten Norman Islanders (BN-2A) of the Philippine Navy- Naval Air Group with their new paint scheme. The navy call it "haze gray," the war paint of the Navy's fleet, designed to make its vessels tougher to see. Good they put the same color scheme on their aircraft. It looks more military now compared to the old "Blue" paint scheme. 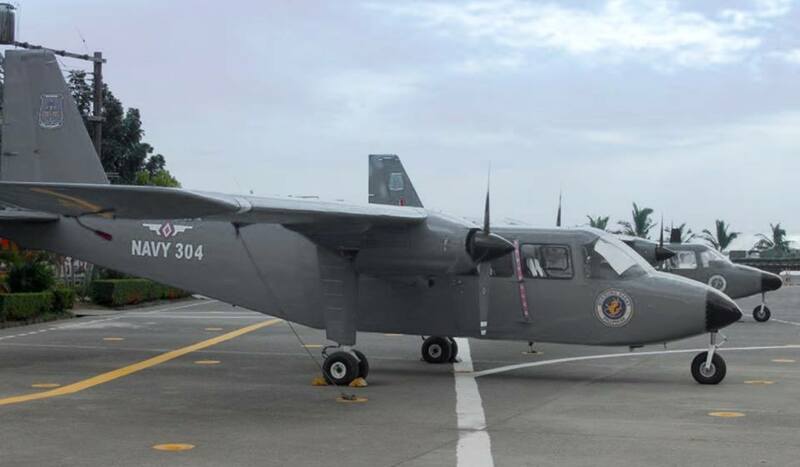 These BN2A Islander aircraft was been refurbished by Philippine Aerospace Development Corporation (PADC). The first newly refurbished BN2A Islander of the Philippine Naval Air Group performed by PADC on 21 July 2015, was Philippine Navy aircraft tail number 320. Three (3) BN Islanders are now in Haze Gray paint scheme. The Philippine Aerospace Development Corporation (PADC) was the government’s arm for the development of the Philippine Aviation Industry. To date, some of PADC’s major accomplishments include the assembly of forty-four (44) BO-105 helicopters and sixty-seven (67) BN Islander aircraft under a licensing agreement with Messerchemitt Bolkow Blohm (MBB)of Germany and Pilatus Britten Norman (PBN) of England, respectively. The Britten-Norman BN-2 Islander is a 1960s British light utility aircraft, regional airliner and cargo aircraft designed and originally manufactured by Britten-Norman of the United Kingdom (UK). Still in production, the Islander is one of the best-selling commercial aircraft types produced in Europe. Although designed in the 1960s, over 750 are still in service with commercial operators around the world. The aircraft is also used by the British Army and police forces in the United Kingdom and is a light transport with over 30 military aviation operators around the world. Two (2) Britten Norman Islanders (BN-2A) of the Philippine Navy- Naval Air Group with their new paint scheme.